RYDF has three primary goals within its overall mission. The first, Dream It, empowers communities by providing opportunities for youth and families to experience fun, friendship, and lifetime health and fitness through participation in racquet sports. The second, Reach It, provides emerging professional racquet sport athletes with financial support, mentoring, and career development opportunities to achieve success on the court and in their life. The third, Live It, uses experts across disciplines to provide knowledge, skills, tools, and practices to improve performance, build a successful career on and off the court, and give back to the community. Rocky provides some on court instruction. Francisco Troncoso is interviewed by board member Mike Manoske. While amateurs were being instructed by Rocky, RYDF-supported players such as Jose Rojas, Mauro Rojas, Antonio Rojas, Jose Diaz, Ricky Diaz, Jaime Martell, Alex Cardona, Bobby Horn, Francisco Troncoso, and Robbie Collins participated in video interviews with board member and career coach Mike Manoske. Following their interview, athletes met with GOAT Sports Performance expert Dr. Tim Baghurst to discuss their career goals and the importance of professionalism in becoming and succeeding as an athlete. Tim also spoke to the amateur athletes and provided some tips on how to overcome negative situations in competition. ProAm doubles soon followed these sessions and amateur players had the opportunity to interact and compete alongside the professionals. This was a time of fun, conversation, and competition enjoyed by all. For amateurs, this is a special event. After all, how often do players get the opportunity to play with and against some of the best racquetball players in the world? Coaches Dave and John Ellis discussing our Fitness Forever program. After the doubles mixer, all participants enjoyed dinner while coaches Dave and John Ellis provided an update on our very successful Fitness Forever program that is part of Dream It. The program is being expanded across sports clubs in California, and the progress Dave, John, and the other coaches involved have made in attracting youth to racquetball is encouraging. 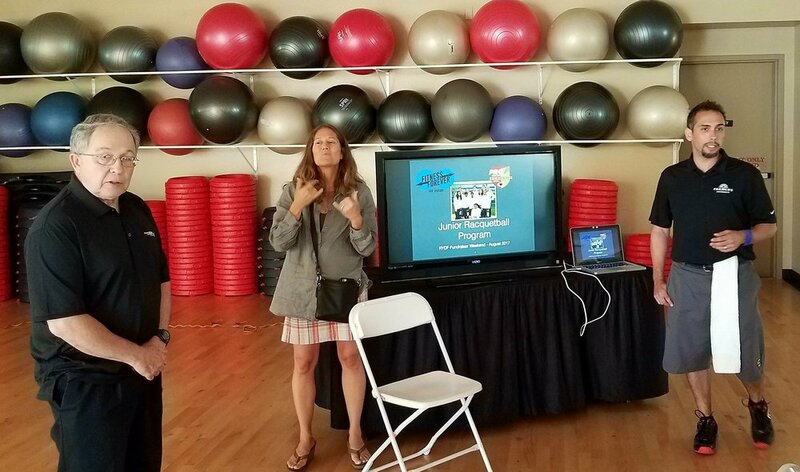 Not only does it provide youth in our community with physical activity opportunities, but also it can be used as a platform to justify to club owners and general managers how racquetball courts can be effectively used. The program’s focus is on engaging youth and children in regular racquetball activities. Initially begun in Stockton, the program has spread to other clubs across California. Coaches interesting in adopting the model should contact us for more information. Rocky Carson and Tim Baghurst were the primary guest speakers at this event. The evening ended with a Q&A with world champion Rocky Carson and performance expert Dr. Tim Baghurst. Topics varied, from whether athletes should have coaches, how game plans can be developed, how sponsors can be raised, and how racquetball has changed over time. However, the primary goal of this time of the event was to emphasize how important all facets of life are in being a professional. This is the first time RYDF has offered a Performance 360 event, but it was well received by all. Although this is the first Performance 360, we intend to continue offering such events in the future. We recognize that while supporting young players financially helps to grow the sport, RYDF also has the responsibility to promote physical activity among youth and train emerging athletes to become professionals on and off the court. To learn more about RYDF or to donate, please visit www.give2rydf.org.